Hazel was born November 8, 1921 in St. Paul, Kansas a daughter of Walter and Lorene (Peak) Miller. She attended schools in Girard. On January 1, 1937, Hazel was united in marriage to Thomas Cussimanio in Carthage, Missouri; he preceded her in death on September 14, 2010. 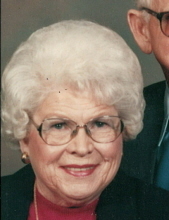 Hazel was a member of St. Michael Catholic Church of Girard. She enjoyed spending time with family, gardening, crocheting, working with stain glass and baking. Hazel is survived by two sons: Thomas J. Cussimanio and his wife Flora of Stewsbury, Massachusetts, Richard Cussimanio of Girard, one daughter: Linda Spicer and her husband Larry of Pittsburg, Kansas, 8 grandchildren and 12 great-grandchildren, two sisters; Mary Virginia Boor and Marie Kasparek. In addition to her husband, hazel was preceded in death by one son: William E. Cussimanio and 7 brothers. Rosary will be at 6:00 p.m. Wednesday, February 6th at the Smith-Carson-Wall Funeral Home with visitation to follow. Mass of Christian Burial will be at 10:00 a.m. Thursday, February 7th at the St. Michael Catholic Church of Girard with Fr. Floyd McKinney as celebrant. Burial will follow in the Girard Cemetery. Friends may call at the funeral home after 2:00 p.m., Wednesday. Memorials are suggested to the St. Michael Catholic Church of Girard or St. Jude’s Children’s Hospital and these may be left at the Funeral Home or mailed to the Smith-Carson-Wall Funeral Home, 518 W. St. John, P.O. Box 258, Girard, Kansas 66743. To send flowers or a remembrance gift to the family of Hazel Lou Cussimanio, please visit our Tribute Store. "Email Address" would like to share the life celebration of Hazel Lou Cussimanio. Click on the "link" to go to share a favorite memory or leave a condolence message for the family.